Apple sapphire supplier GT Advanced Technologies' woes continue today with the announcement that it will not appeal the suspension of its stock on the NASDAQ stock exchange. As part of this decision, the company's stock is no longer being traded on the NASDAQ stock market effective today, October 16. This removal was expected and is the result of the company's recent Chapter 11 bankruptcy. GT Advanced Technologies Inc. today announced that it will not pursue an appeal of the determination by The NASDAQ Stock Market LLC ("NASDAQ") to suspend trading in the Company's common stock based on the Company's voluntary petition for reorganization relief under Chapter 11 of the United States Bankruptcy Code. The Company has been informed that NASDAQ will suspend trading in the Company's common stock effective at the opening of the market on October 16, 2014. 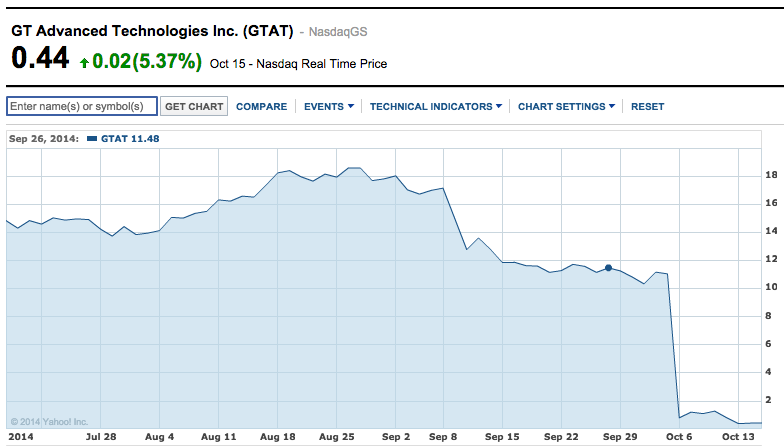 GT's stock plummeted 90 percent following its bankruptcy announcement earlier this month, and has continued to fall since then, closing at just 44 cents per share yesterday. The stock will continue to trade under the symbol GTATQ on the OTC Pink marketplace. As part of the original deal, Apple made three loan payments to GT totaling $440 million and said it was working with GT to help overcome technical challenges to qualify for the fourth and final prepayment loan of $139 million. Apple also appeared set to delay scheduled repayments on the debt. But under the weight of difficulties that began at least as early as February, GT found itself unable to carry on its business operations and filed for bankruptcy with plans to shut down its sapphire production facilities. Apple is going to have the last laugh when everybody realizes the Cupertino Spaceship is actually a giant sapphire furnace! What a kick in the boules!! Yesterday, forum member Makosuke and I were discussing the merits of the original deal and (s)he brought up an interesting point. If the info from that discussion is valid then I'm looking at Apple with a sideways glance and asking why? Personally, I wouldn't have fallen for GT's song and dance but, if true, it would go a long way towards explaining why Apple had such a draconian contract drawn up. They may have been skeptical as well but considered $500 million an acceptable gamble. Now that I look at, I guess I really can't question Apple's judgement. My pocket and Apple's pocket hold slightly different volumes. Just slightly. :rolleyes: Relative to the potential reward, the risk for Apple wasn't that great. Samsung Electronics Co is down 9% since then. When your stock goes below $1.00 after announcing you're filing for Chapter 11, the fat lady is already singing because this party is over. Gorilla Glass wins this round but sapphire crystal displays will eventually come to the iPhone, but GTAT won't be the supplier. hell i wonder what happend to apple stock since the new iphone6 came out. it's been on the down swing. while samsung is on the up swing. The Nasdaq is down 8% since then in case you haven't been paying attention. This is certainly one of the shadiest, fishiest, weirdest & interesting things I've seen in awhile. And yet much secrecy surrounding this... Something definitely isn't right here. Maybe they took the hit for Apple? Apple still owns the sapphire equipments and facility(ies) right? GTAT CEO: I'LL TAKE IT! sorry brah but i live in the USA so i use ny stock exchange which is on the usd scale. and i don't use the "won" which the currency for korea. ticker for apple is "aapl" and for sammy it's "ssun.de" and how quickly things change sammy is now dn -.87% and appl is -1.06% so both are now on the down swing. but apple may go up today after the ipad annoucement. Samsung Electronics is a Korean company and is traded on the Korean exchange. It is not traded on the US markets. All you did was just post the ticker for the Frankfurt exchange for some derivative. But by all means, continue your ignorance.